With the Sedona Combo food dehydrator by Tribest, you can accurately and efficiently dehydrate your favorite food and vegetables utilizing the latest in digital dehydration technology. From, apples to bananas, to mushrooms and your favorite dehydrated treats, you can set Sedona Combo to meet all your dehydrating needs. Sedona Combo is the advanced solution to dehydration - offering you all the options you require to make the dehydration process as simple and as convenient as possible. With Sedona Combo, you can set the timer up to 99 hours on RAW Mode or to FAST mode to speed up your dehydration times with TSE. Because Sedona Combo utilizes two independent heating mechanisms, the distribution of heated air is evenly circulated dehydrating your foods evenly. Sedona Combo offers you the ability to dehydrate a little or dehydrate a lot. Dehydrate up to 9 trays of fruits and vegetables or divide the machine into two 4-tray chambers for smaller batches of your favorite dehydrated recipes. Sedona Combo also offers you a convenient way to monitor your foods with a see through a tempered glass window at the front of the unit. With the Sedona Combo dehydrator, you can be confident that the temperature you set on the digital control panel is the temperature that is maintained inside the dehydrator because it microprocessor controlled. 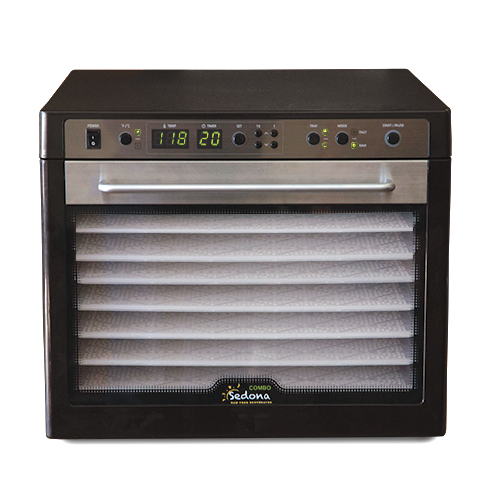 The Sedona Combo dehydrator includes the new one piece tray design. The one piece tray design allows for less parts to clean as well as offers better airflow inside the machine. The Sedona Combo includes a newly designed drip/catch tray that will contain any drips or crumbs that may fall to the bottom of the dehyrator. This will save you time when cleaning the Sedona Combo. The Sedona Combo has a newly-designed stainless steel handle for that upscale appearance in your kitchen. The Sedona Combo is the worlds first dehydrator to include TST into its features. Two-Stage Sequential Temperature-Timer (TST), even more control is at your fingertips. The TST allows you to set the Sedona Combo to kickstart the dehydration process at a higher temperature and then automatically lower the temperature to finish off the dehydration process. The automatic settings of the TST allow for faster dehydration times while still preserving your precious enzymes. The Sedona Combo has been redesigned to improve the air-flow characteristics inside the dehydrator to ensure better, more even dehydration. The Sedona Combo Food Dehydrator is engineered to last. The 5 year warranty is your commitment to you that your dehydrator will provide years of trouble-free operation. Tribest have been offering small appliances for healthy lifestyles for over 20 years. 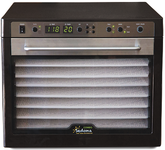 The Sedona Combo dehydrator is their latest product that allows you to lead a healthier lifestyle. The control panel on the dehydrator allows you to set the temperature inside the unit as well as the digital countdown timer.